Burger King has gone to great lengths to keep its signature Whopper sandwich fresh and exciting in recent years -- everything from serving it on alarmingly red (or black!) buns to stacking literally eight slices of cheese on top. Now, the royal burger slinger is unleashing a new take on the iconic, 62-year-old burger in an extraordinary move to keep up with today's tastes. It's called the Impossible Whopper, and unlike every Whopper before it, it's 100% meat-free. As in the burger patty is made with plants, not beef. Yes, for real. 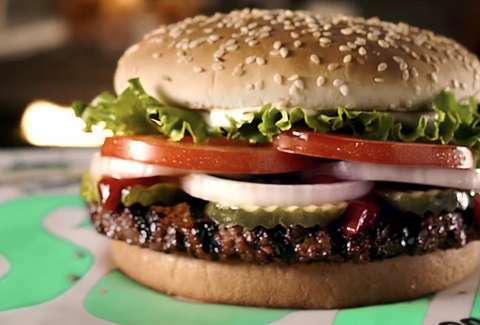 BK officially unveiled the Impossible Whopper on Monday, but it's no April's Fools Day joke. The chain teamed up with Redwood City, California-based Impossible Foods to create the new burger, which features a flame-grilled, plant-based patty that -- just like a regular Whopper -- comes topped with tomatoes, lettuce, mayo, ketchup, pickles, and onions on a sesame seed bun. They're currently available to order at 59 Burger King locations in the St. Louis area as part of an initial test run that could potentially lead to a nationwide rollout, depending on how well they sell, according to a spokesperson. Does the Impossible Whopper taste like a classic Whopper? Is it even remotely as good? Burger King claims the Impossible version is "as juicy, craveable and delicious as the original," and if you've ever tasted an Impossible Burger (they're served at more than 5,000 restaurants across the country), that's not hard to believe. They're legitimately good and even have as much protein as a typical beef patty. They could very well be good enough to fool a meat eater, but as Thrillist recently pointed out, "if we assume people love burgers simply because they taste good, no trickery is needed." Of course, that didn't stop Burger King from messing with people. It's April Fool's Day, after all. Along with the Impossible Whopper announcement, the company released a new video (shown below) that captures the reactions of people who were secretly served the Impossible Whopper after they'd ordered the classic version. The reactions were various exclamations of disbelief, including a few (censored) F-bombs. The video is probably staged and almost certainly highly edited, but it's still pretty amusing. 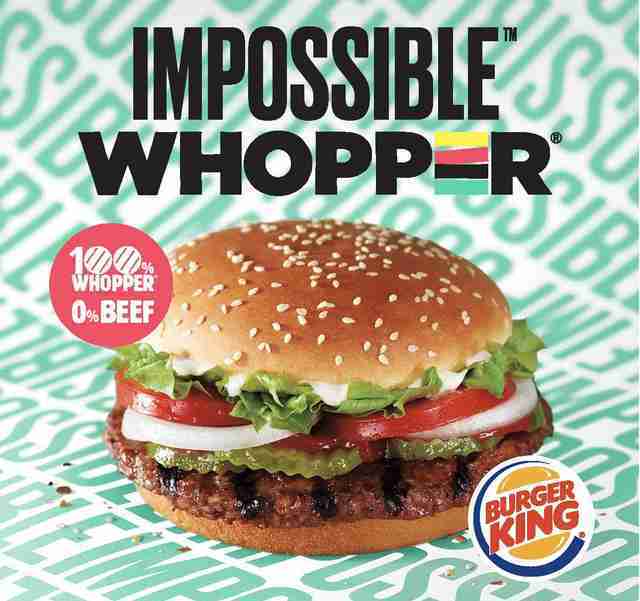 If there's one takeaway from the April Fool's prank, it's that at least a handful of people couldn't immediately tell they weren't eating a Whopper made with real meat, which again, is not at all surprising considering how meat-like Impossible Burgers taste. If you've never eaten one and are curious, the latest version of the meatless meat is made with a few simple ingredients: water, soy protein concentrate, coconut oil, sunflower oil, and natural flavors. Burger King said the Whopper version packs 17g of protein, 12g of fat per 3.5oz serving, and 0mg of cholesterol. A classic Whopper, on the other hand, has 28g of protein. Burger King isn't the first fast food chain to add Impossible Burgers to its menu, but it's likely the biggest if you don't count casual chains. White Castle was actually the first to the fast food Impossible Burger, when it introduced Impossible Sliders at all of its locations last fall. More chains will likely follow suit. In fact, Red Robin announced it too will start serving the Impossible Burger nationwide, starting on April 1. Your move, McDonald's. Hell, maybe Taco Bell will end up serving Impossible meat tacos some day. There's no telling if the Impossible Whopper will land at Burger King locations across the country, but considering the trend, grabbing one at your local BK sometime in the near future appears to be likely. It all depends on St. Louis. Then again, that might not be a good thing.